Militants cease shelling after dark. Over the past day, three servicemen of the Armed Forces of Ukraine have been wounded amid six attacks by Russia-backed terrorist groups 7 p.m. Kyiv time on Monday, after which no firing was recorded, the ATO HQ press centre reported in a statement on Tuesday, 9 January. In the Luhansk sector, the enemy was shelling the positions of the Ukrainian army at the Svitlodarsk salient for over four hours. First, the militants fired with heavy machine guns and 120-mm mortars to provoke the defenders of Luhanske to return fire. They released around 50 rounds of ammunition and later targeted the outskirts of Svitlodarsk with machine guns and grenade launchers. In the Donetsk sector, the enemy fired heavy 120-mm mortars on the defenders of Pavlopil and shelled the area of Talakivka with IFV weapons, grenade launchers and machine guns. Around Novotroyitske, the enemy intensified fire at lunchtime, using mainly small arms, including sniper weapons, and later stepped up shooting by using grenade launchers. In this area, ATO forces had to give the enemy an adequate response from small arms and grenade launchers. UPDATE. The spokesman for the Defence Ministry on ATO issues, Col Oleksandr Motuzyanyk, said at the morning briefing that some Ukrainian troops sustained injuries in the areas of Svitlodarsk and Novotroyitske. The wounded servicemen were hospitalized, one in grave condition. 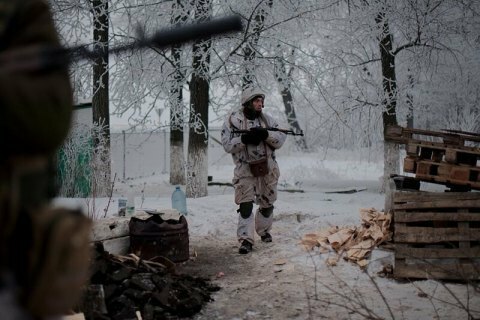 On the Christmas Eve, the militants waged one shelling attack in the ATO zone. One Ukrainian serviceman was wounded in combat.